So Fred Goodwin is just Fred Goodwin now. Btw this isn’t the butcher in Corrie. I’ve never really understood this anachronism. He’s been stripped of his knighthood meaning his children can’t get married in St Pauls Cathedral. Boo hoo. Ahh its so bloody British. Here we dent his pride and leave him with the all the money. But really this is a symbolic measure, a singling out of one man and his bank which failed due to an over-aggressive and ill-timed takeover of ABN. Yet the whole system of lending, the lack of capital back up, the methodology of imagining wealth/asset value, the moral hazard created by an arrogant and flawed understanding of finance alongside wilful neglect by the regulatory leadership. And all in a totally unsustainable manner. But for now that we’ve hung Fred out, I guess we can ignore all those problems. Until the next inevitable bubble and collapse. 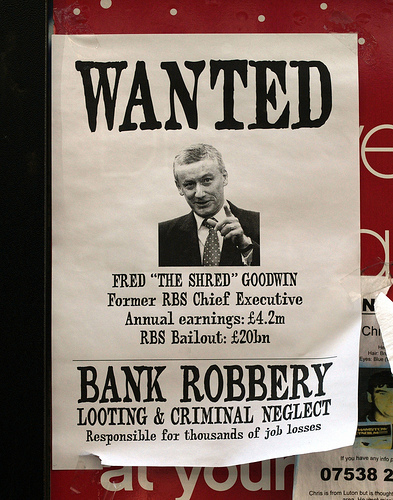 This entry was posted in news and tagged finance, fred goodwin by Dan. Bookmark the permalink.